Let Burgess help you with more than just moving. We can pack up your belongings or just lend a hand in helping you. We're here to help in any capacity you choose. We’re experts in commercial moving and offer a variety of essential services. We take the stress out of packing and moving, so you can focus on running your business. 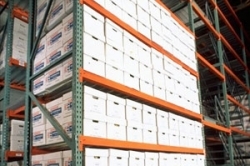 We can provide records management services for the secure storage of files for many industries. From boxes and tape to blankets and bubble wrap. We've got you covered! Your Burgess movers are packing pros. "Burgess did a great job with loading and transporting our household goods last week from storage in Moreno Valley to Loomis, CA - one of our best relocations and we had ten PCS moves in 26 years in the Air Force. All the Burgess staff we had contact with were real pros and on time - from John doing the estimate to Tom handling the paperwork to Eloy, our driver, and his crew loading and unloading. I'd hire them again, no question." "I have used several moving companies over the last few years and by far Burgess North American was hands the best company I have ever dealt with. Everyone involved were always on time and extremely honest and professional! All the way from the agent doing the quote, the packers and the movers! This of course was organized by Alyson Mattox, the Logistics Coordinator who was such an amazing professional to deal with. Alyson went out of her way to excel in customer service, she is one of a kind!! If all companies had employees like Alyson, their success would skyrocket!!! "This is the third time we have used Burgess for our move and, as usual, they were outstanding! From the walk through of the house, to the professionals that did the move - it went very smoothly. They really make it seem easy, although moves can be stressful...and not one item was broken or damaged. Thank you Burgess Moving & Storage!!!!!" Burgess Moving & Storage was established in 1983 and has been under the same ownership since. We are a family-oriented organization which seeks to take care of our employees and customers, alike. At Burgess Moving & Storage, we strive to establish permanent business relationships by providing exceptional customer service before, during and long after the move. Our professional team has one goal in mind...to exceed our customers' expectations, no matter how great the challenge. Burgess Moving & Storage serves the Southern California market and is centrally located in Riverside, putting us within reach of most Southern California cities from the desert to the beach. As a provider of storage services to the Department of Defense, we continue to meet their stringent requirements in the areas of facility safety, security, fire protection and pest control. All of these areas are monitored by outside firms on a regular basis. Likewise, we hold a California Public Utilities Commission license required for the transportation of goods and documents. This assures our customers that our vehicles meet safety and insurance requirements established by the State of California. Burgess Moving, Riverside CA © 2018 All Rights Reserved.